Home/beer, Coffee/Presta Coffee and Brandy Alexander Oak-Fermented Stouts! If we have any sort of motto, it would probably be something along the lines of “everything matters.” After spending a year and a half taking the approach that every ingredient and every little part of the process is important, few things seem more confusing than the oddly ubiquitous concepts in the brewing industry of “filler” fermentables or hops. All grains aren’t created equal. All hops aren’t created equal. Each product has something unique to offer, and there exist huge variations in quality within each type of product too. Why put anything into a beer that isn’t both exactly what you want as well as the best you can possibly make or get of whatever it is that happens to be? We’ve never deviated from that approach with any of our brewing ingredients. It occasionally feels strange thinking that we’ve been making beer since October 2016 and haven’t bought an ounce of two-row barley, what I’d bet is probably the base malt for the vast majority of craft beers in the US. There’s good two-row out there, of course, but Maris Otter is usually exactly what we want for the taste we’re seeking. The premium price for the floor-malted type we prefer is more than worth it. Similarly, I don’t know that we’ve ever made a hoppy beer with even the tiniest bit of hops that aren’t of sufficiently high quality to shine on their own. Sure, a fragrantly piney and terpene-filled Denali single-hop beer might not be everyone’s cup of tea (though man did people love our regular IPA dry-hopped with it), but the quality of the Denali we used was undeniable, even when it was just a tiny component in our big, complex Dank Fruit Double IPA. Adding adjuncts (or perhaps more precisely “additives” or “flavoring adjuncts,” depending on if/how you want to be dogmatic about it) has been a very different process. We’re all foodies here, but no matter how much we might have fancied ourselves experts on various ingredients we’d researched on the internet, none of us knew lemon varieties or hazelnut suppliers like Weedy knows Pils malt or Pacific Northwest hops. We knew where to get excellent ingredients to add to our beers. We knew they’d tasted great in previous brews. But how would they compare to the same product from a different growing region? Or prepared with a different process? Or fresher? The barrel society gives us the perfect learning opportunity for mastering every ingredient, even those added months or years after the beer has finished. It provides an educational experience sampling and using a wide variety of interesting ingredients that will enrich our knowledge to the great benefit of the members. And that’s the primary focus of two of our first three Barrel Society beers of 2018. Both of the stouts we’ll be releasing to members in a little over a week began their life as a 9.0% ABV oak-fermented Imperial Stout. It was the darling of our tap room for quite some time in 2017, but we’d held back some of it for extended aging. The oak-fermentation imparted a spicy dryness that disguised the ample sweetness of the stout generally and added a leathery, almost snuff-like character. The ABV – slightly lower than some of our other offerings – would give subsequent barrel treatments the ability to truly shine. If you’re going for an abundance of barrel, it’s likely to come through better in a delicately balanced 9.0% ABV stout than in a barroom-brawler mid-teens-ABV beast of a stout. We had a great canvas, so we just had to decide what to do with it. The first part of the equation is the barrel itself, and we definitely wanted to continue our commitment to exploring the truly remarkable elements oak alone can add. We had all these beautiful barrels with varying degrees of toast made just for us, so why not use them? In 2017, some of our society members couldn’t wrap their heads around the barrel beers we made in barrels that hadn’t previously seen a spirit of some kind, but we made a lot of converts too. Once you’ve had a beer that exemplifies the smooth and sweet character of charred oak or the spicy vanilla of toasted oak, even an exceptionally well-made beer whose character is dominated by the blunt and pedestrian-by-comparison flavor of a spirit isn’t always going to cut it. One of these beers had to see more oak from a barrel that had never held any sort of spirit. As for the other barrel, that was mostly just dumb luck. As soon as we found out about the opportunity to get dripping wet Cognac puncheons direct from France, we jumped on it. Even better, the barrels had held twenty-year-old Otard XO just days prior. It’s a hidden gem in the Cognac world, perhaps for no other reason than because it’s a bottle far too stylish for its own good. Generally relegated to duty-free shelves where people who don’t know grab it because it looks awesome, it’s one of a very small number of bottles that people I know who are really into Cognac will buy just as eagerly. Fast forwarding from 2017 to 2018, as the beers neared the end of their time in barrels, the question became what to do with each of them. While the 2017 Barrel Society proved to us as well as most of our members just how amazing oak alone can make a beer, we also learned that, for some people, no matter how amazing the oak character might be, it will never satisfy many people. The double-oaked stout needed something extra if we were to do our best to please all of our members, and we didn’t want to take the obvious route of using a second wet barrel given the number of times we’d already done that (and will be doing it again this year). 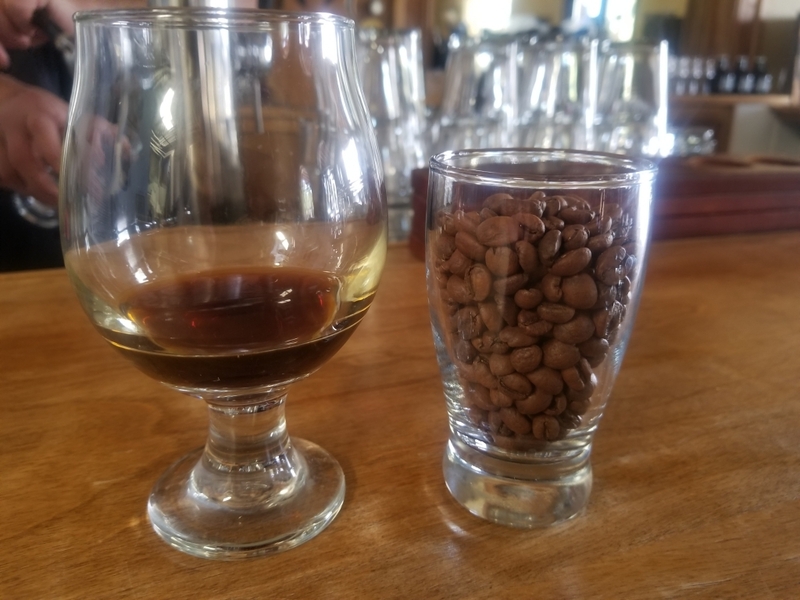 The answer about what extra something we should add came after drinking some amazing coffee from Presta Coffee Roasters in Tucson. Everything I’ve had from Presta has been exceptional, but their Organic Guji from Ethiopa was a standout among standouts for me. They describe it as having “lots of fruity and floral flavors with chocolate, apple and berry,” and they’re right. 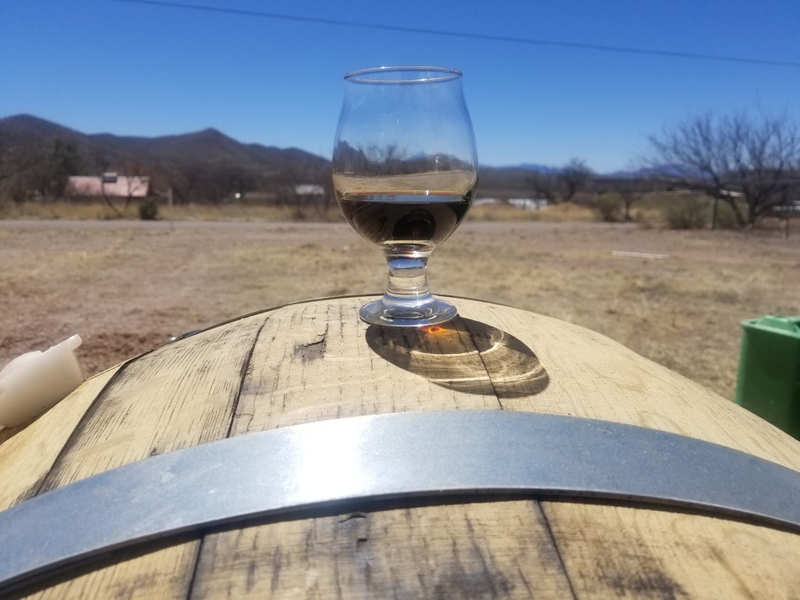 In particular, it was an intense blueberry quality that seemed almost too perfectly suited to the oak-fermented stout we had aging in an oak barrel. The coffee was bright and juicy. It seemed like the ideal compliment for the woodsy, earthy stout. In the aroma, the beans accentuated the vanillins from the oak. It smelled like what I can only really describe as objectively perfect coffee, if such a thing really exists; like the first time tasting coffee ice cream as a kid, it seemed to come with the realization that there’s this unique and exotic yet still accessible flavor that you haven’t even begun to explore. The flavor delivered too. Drinking it involved waves of maple wood, ambrette seed, caramel, various hints of spice, and gentle tannins laced throughout. It’s a stout, but it’s about the coffee. Like I said in the beginning, everything matters, and using coffee on the level of what Presta makes drives that point home. As for the Cognac barrel, how best to finish the delicious liquid inside of it was again a less obvious and more luck-driven endeavor. So much of the Cognac-drinking experience is the integrated whole of the product, and it turned out that the character that made it into the beer only hinted at the richness of the liquid that lived in it for two decades. I’m probably starting to sound like a broken record, but we learned a lot making last year’s member beers. The best learning experience for me involved the Port barrel beers. For me, Port is about structure and complexity, yet the name more often merely signals “sweet dessert wine” to consumers. When we aged a less-than-cloying beer in a Port barrel, we accentuated the acidity and flavors of apricot and citrus peel. It wasn’t at all what people expected, and if there was an over-arching lesson to 2017, it was that expectations are damn near everything when it comes to the popularity of a beer. We’re going to keep pushing the envelope, but the end game still remains producing beers people love to drink. Aged in a Cognac barrel, the stout ended up best serving as a vehicle for some blunt rose and clover characteristics. It became immediately apparent that the beer needed something more to really shine and please. It had an interesting character, but the fullness and decadence of the Otard didn’t translate. We went with Heilala vanilla. It is not as floral as Tahitian vanilla, but it’s intensely floral nonetheless. A deep, robust, and incredibly aromatic vanilla quality now clearly dominates the beer. For the cacao, we chose Venezuelan nibs from Valrhona. More subtle than the vanilla, they give the beer a rounded, delicate milk chocolate character that fills the nose. It completes the Brandy Alexander profile we were seeking. What’s fascinating is that, since adding those ingredients, a fleeting vanilla-grape vapor now finishes the experience. Honey, plum, and hazelnut are now in abundance. It was as if the additions brought out things from the Cognac that were previously masked. There’s even a hint of Rancio Charantais now, nothing approaching the funk that Otard sometimes exhibits, but more like hazelnut, leather, and dried rose. In the finish, it all comes together to accentuate a vanilla flavor so deep and rich that it comes off like a creamy bourbon dessert. These beers both use the absolute best ingredients. That started with what went into the base recipe and continued to the oak for fermentation, the oak for aging, and even later ingredient additions. We’d like to think the end products are testaments to our philosophy that everything matters. We hope our Barrel Society members will agree!